We welcome visitors to play at Strathendrick Golf Club, visitors are welcome to play Monday to Friday and at weekends at restricted times if Club competitions are on-going. Green fees:- Gents & Ladies £15 for day tickets, or £10 for 9 holes only. Juniors are half the above rate.All green fees must be paid before play commences. ​Visitors can play Monday to Friday & weekends subject to availability. Visiting parties wishing to play at the weekend must contact us in advance for a tee time. All large Group bookings accepted for weekends must be paid in full 7 days in advance, failure to do so will result in a loss of booking. Any / all bookings which have been accepted for the weekend will be subject to a cancellation fee of £25. Any refunds will be returned less £25 cancellation charge. In the event of the course being closed a full refund or another suitable start time will be arranged. 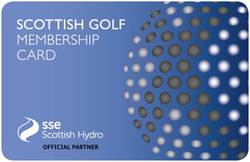 Scottish Golf Union Membership card holders pay £10 per round. Please book 24 hours in advance. No football colours or track suit bottoms please. Play is not allowed outside the allocated time . Slow play, visitors are reminded that it is their responsibility to keep up with the group in front of them. Should they fall one clear hole behind, and they are delaying the group behind them, they should invite the group behind them through.Pitch marks & divots should be repaired at all times; failure to do so is an affront to the green keeping staff and a discourtesy to fellow golfers. MOST OF ALL: ENJOY YOUR GAME! From Balloch take the A811 and follow the signs for Stirling. Continue on this road until the junction of the A809. Turn left and cross the bridge over the river Endrick and 200 yards later, turn right into the lane to the course. While on the A811 from Stirling pass Drymen Village and the entrance to the course is on the left 40 yards past the entrance to Buchanan Castle Golf Course and 200 yards before the bridge over the River Endrick. Follow the A809, pass through the village of Croftamie until the road joins the A811. Take the A811 cross the bridge over the river Endrick and 200 yards later, turn right into the lane to the course.